It’s that time of year again. Next week, tens of millions of us will hit the roads, consume millions of pounds of turkey, and then spend billions on Black Friday deals. 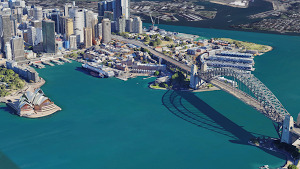 Google Maps looked at Thanksgiving trends from the last three years to uncover the most useful information to make your holiday plans go a little bit easier. Whether you’re traveling, doing some last-minute grocery shopping, or Black Friday deal-dashing, here’s our day-by-day guide to braving the holiday crowds. Tuesday: No travel day leading up to the holiday is going to be a breeze, but if you can, start driving Tuesday rather than Wednesday. 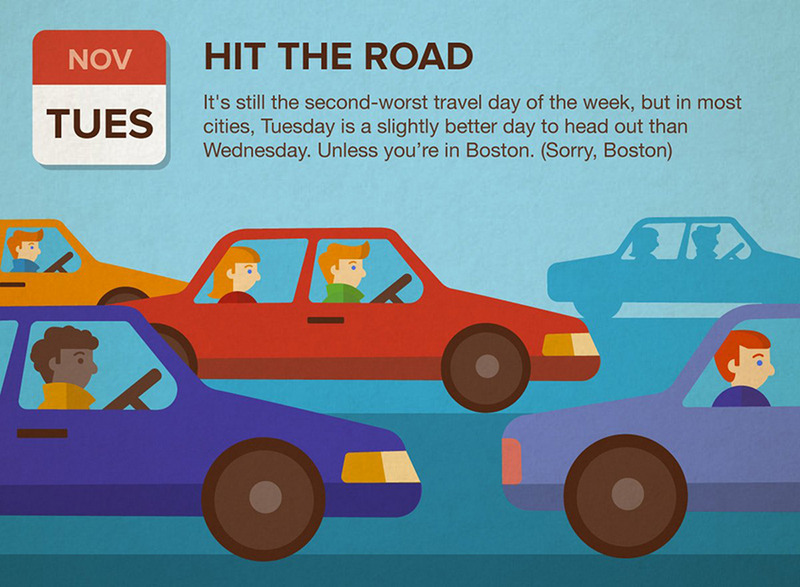 Yes, it’s still the second-worst travel day of the week, but according to Google Maps searches, for the last three years Wednesday has been the worst travel day—with the exceptions of Boston (Tuesday), and Honolulu, Providence and San Francisco (all Saturday). 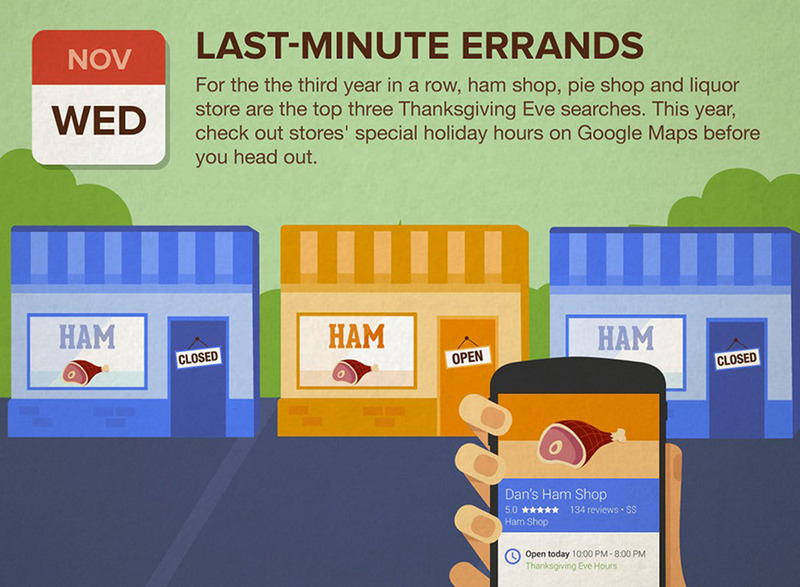 Wednesday: Americans are pretty predictable when it comes to the holidays: for the third year in a row, “ham shop” was the #1 trending destination search on Google Maps the day before Thanksgiving. Whether you’re running out to a ham shop, pie shop (#2), or liquor store (#3), make sure you don’t head all the way there just to find it closed. This year Google Maps and Google Search have added holiday hours, so when you search for a business, you’ll see its updated holiday schedule. 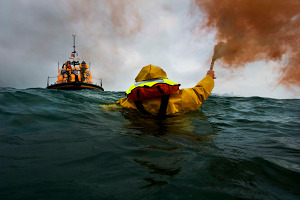 Thanksgiving Day: Maybe folks were put off by the trauma of last year’s burnt turkey? 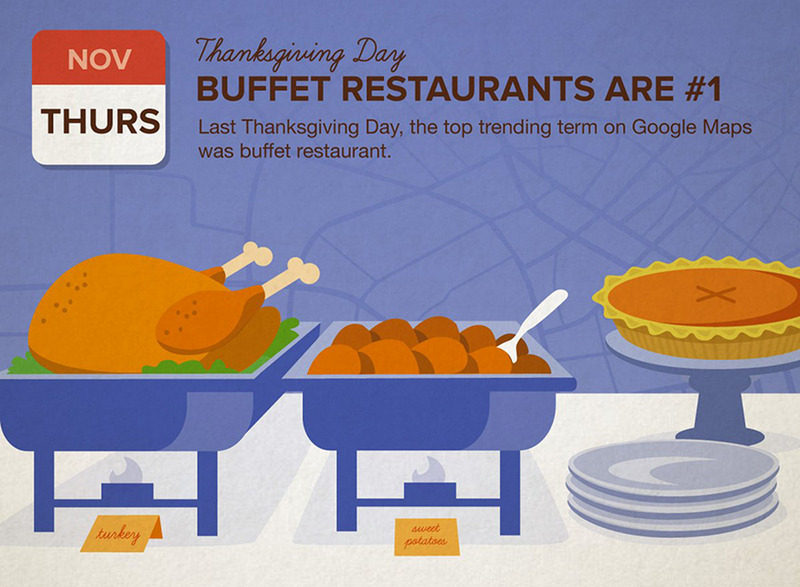 Nationwide, “buffet restaurants” were the #1 trending Google Maps term on Thanksgiving Day. 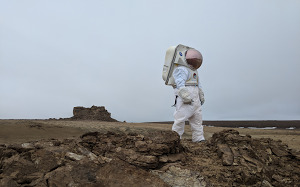 But locally, folks were heading in other directions. In Houston, “doughnut shops” were trending on Thanksgiving. It was “bars” in Chicago— maybe people needed a break from their families. And Miami residents were interested in looking their holiday best—”beauty salons” were among the trending searches by the South Beach crowd. 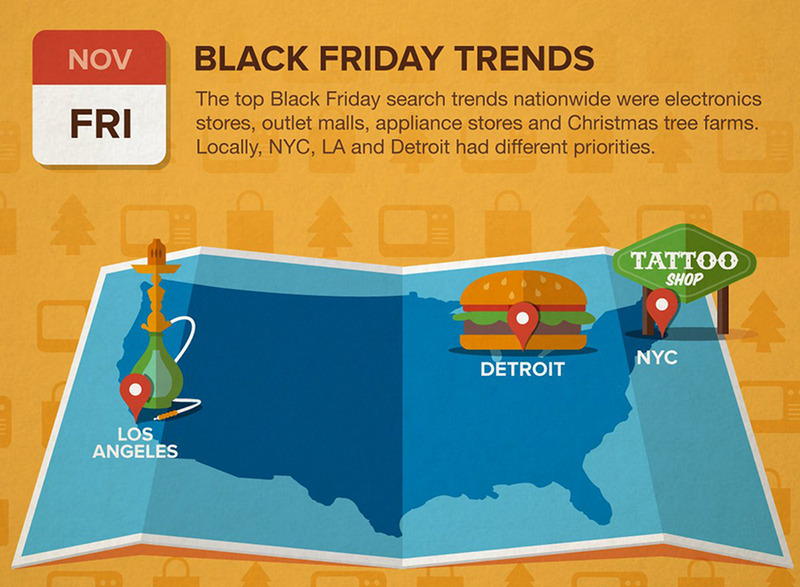 Black Friday: The top Black Friday Google Maps trends nationwide were predictably of the “electronics store” and “outlet mall” variety—with “Christmas tree farms” not far behind as people looked ahead. Digging into local trends, however, things get more surprising. New Yorkers were on the hunt for tattoo shops, among other things, Angelenos for hookah bars, and people in Detroit spent their Black Friday on the lookout for hamburgers. Whether you’re in the market for a Christmas tree tat or shopping deals, here’s a tip: use the Explore feature on Google Maps to discover the stores, restaurants and local entertainment around you. The weekend: Traffic patterns show that you’re better off driving home from a long weekend on Sunday rather than Saturday—traffic can be up to 40% worse on Saturday. 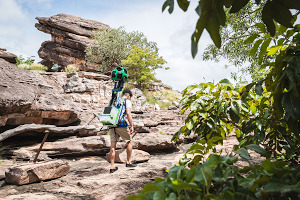 And Google Maps will be with you all the way home, helping you check out gas prices and add detours to your route, without having to exit out of navigation.